Newly planted young trees, like many other living things, need help before they can grow on their own. This is called an establishment period - where the tree grows its root system strong enough to support itself and withstand a range of harsh conditions throughout the rest of its life. Those receiving GGCP free trees have been made aware of their responsibility to water their trees for the first two years of establishment. Failure to keep your trees watered could result in your tree not reaching its full size potential, increasing vulnerability to pests and diseases or death. Trees need 25 gallons of water, approximately 1.5 inches of rainfall, per week to survive. We’ve made watering easier and more efficient by including a free 15 gallon green gator bag (above). 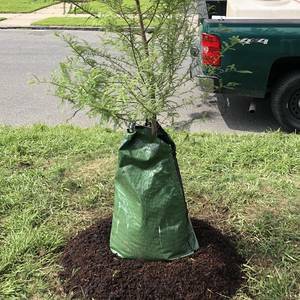 This bag offers a “deep watering” method for your trees. Deep watering keeps the soil moist to a depth that reaches all the roots for a longer period of time, therefore speeding root establishment. Watering by hand does not reach all of the roots and has to be done more frequently. This method can also lead to overwatering or underwatering, both of which can be detrimental to tree health. *note: there is a small opening, approximately 4 inches long, at the top of the bag to insert a hose. Water should NOT go in the open space between the trunk and the bag. The trunk should not be wet by any means. Like and Follow us on Facebook to stay up to date on news and events!